Concrete sandblasting is an abrasive blasting technique used to blast concrete away to expose the aggregate beneath it for a rough surface finish. In addition, the concrete sandblasting procedure is also designed to instantly remove dirt and grime, or simply for graffiti removal. As the degree of concrete sandblasting may vary according to the condition of the concrete and desired end result, our professional team of concrete sandblasters specialise in carefully evaluating textured surfaces and drawing up a highly efficient and effective action plan suitable for optimum reconditioning. Over the years, wear and tear causes an inconsistent ratio between the stone and cement ratio of concrete. The result is often an under-exposed aggregate. The restoration of concrete to its original condition, therefore, requires a heavy blast removal of cement in the built-up areas and a whip blast to achieve an exposed aggregate concrete finish. From concrete patio walls and columns to concrete driveways, floors and sandblasting paint off concrete, sandblasting is one of the most effective ways to restore your concrete for a non-slip and coating-free solution. Concrete sandblasting is generally required when stones are buried beneath the cement. The restored finish should, therefore, see stones being exposed to achieve a rough texture and an even ratio of cement and stone. This is what makes ProStrip Sandblasting’s abrasive blasting media perfect for refurbishing concrete surfaces to the desired concrete finishes. 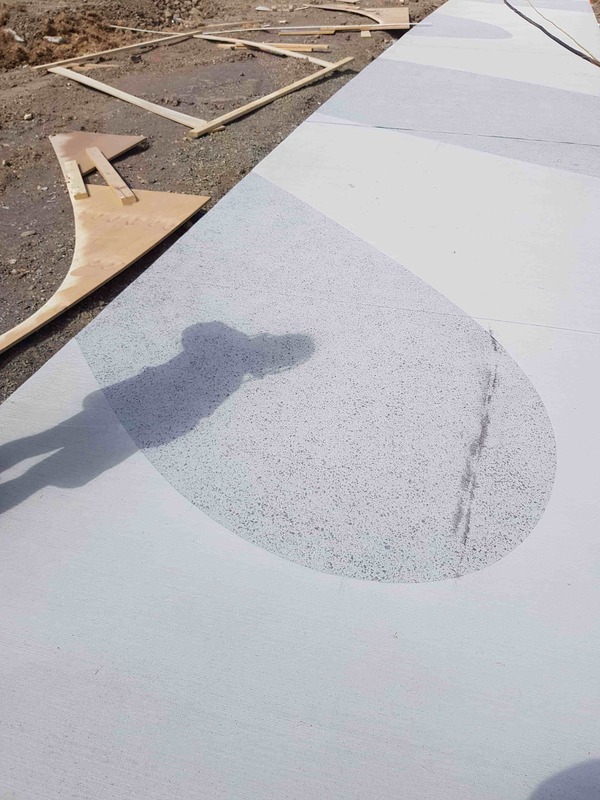 During the concrete sandblasting process, the abrasive material travels at a high enough velocity to generate friction on the concrete surface being prepared. However, having a concrete surface restored back to its original condition also requires particular concrete sandblasting procedures and industrial sandblasting equipment, as the degree of blasting depends on the current condition of your concrete. While certain sections of the concrete surface may require a light cleaning, other parts may require deep cutting to achieve the desired textured concrete finishes. Any abrasive blasting tool can be used for light concrete sandblasting, however, with control over the equipment media and pressure, our high performance sandblasting equipment is able to produce a range of cut depths to the concrete in question. With the use of stencils, we also offer distinctive decorative patterning for further sandblasting needs. ProStrip is Melbourne’s leading specialists in creating exposed aggregate finishes – an ideal solution to restoring worn and torn concrete and relayering new concrete. Concrete sandblasting provides even concrete finishes in the consistency of the cement and stone ratio in comparison to using conventional methods. Sandblasting is a much more affordable and time-efficient solution than the cost involved in ripping up the concrete, disposing the debris and then adding a new layer of concrete. The concrete sandblasting technology uses compressed air to project abrasive material at the concrete for an exposed aggregate; thus avoiding irreparable damage to the surface. ProStrip Sandblasting is able to effectively and economically restore concrete to its original surface condition with minimal effort for the preparation of further treatment.